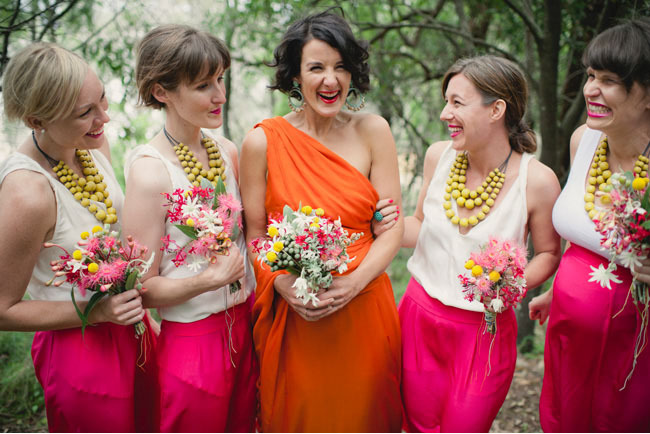 As the year proceeds into blazing summer, how’s a vibrant pop of colour at your wedding to make your day brighter? Neons have been tearing up the fashion runways for the past few seasons, but few couples have incorporated them in their weddings, perhaps because these colours can seem rather intimidating for the less initiated. Today, Wedding & Travel puts together some inspiration from around the web to show you how simple it can be to use these energetic shades! The easiest way to get started on neons is to have fun with them in your invitation cards. Neons are naturally spot on if you are planning a fun and casual wedding as they convey a sense of rhythm and energy in the design. But not to worry, couples who are planning a more elegant affair can make neons work for you too — look no further than the elegant set of letterpress invitation cards above for proof. While the simple white invitation cards convey the formal tone of the wedding, a dash of neon pink on the rims instantly add a fashionable touch to the cards. 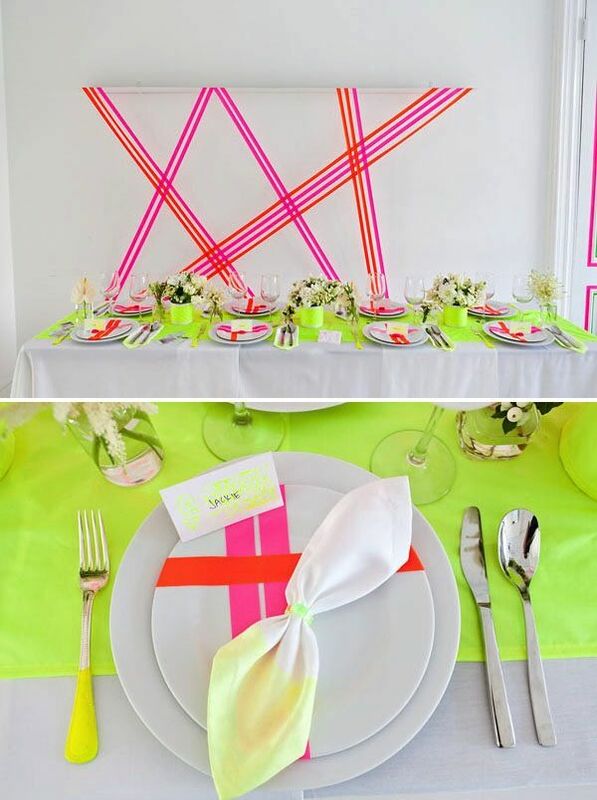 Fun-loving couples who are looking to get more adventurous would love these bold table settings and decorations. From tangy apple green to fluorescent pinks and oranges, a skillful mix of neons at your wedding are bound to get your guests in a sanguine mood as well. We especially love the idea of using washi tape as wall decorations in the first picture above. Not only are they beautiful to look at, from a more practical perspective they are also a dream to install and take down, saving you lots of fuss and pain over the decorations! 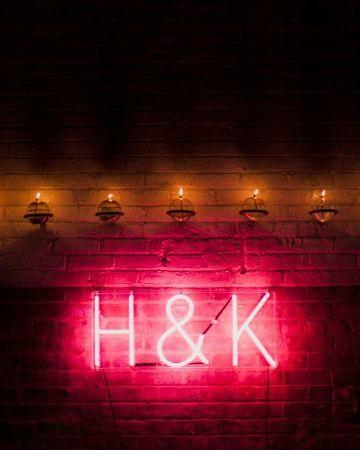 We also love this out-of-the-box idea of using fluorescent lights at the wedding. The trick is to always remember not to go overboard with the lights, unless you want your wedding to start looking like the clubs. Choose to keep things simple and classy by doing up only your initials. And how could we forget neons for our bridal fashion? 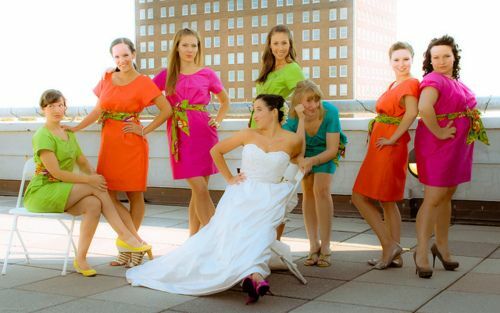 It’s time to throw all your preconceptions of how wedding dresses should be white out of the window — we love how the bride and her bridemaids are a colourful portrait of joy in the above picture where she chose neon orange for herself and neon pink bottoms for her bridesmaids! Similarly, though the second bride chose to go with white herself, her bold choice of neons for her bridesmaids is the hallmark of a confident bride who is not afraid of being outshone by her friends! A big plus point for going with neons is how the colours are going to ‘pop’ and look fantastic when your photos come out! For brides who are still a little apprehensive of going all out with neons, a touch of colour in your makeup or accessories would do fine to accentuate your get-up as well. We love this fluorescent rendition of the clear heels that were first spotted off Chanel’s runways. We also adore the unexpected use of hot pink on the classic birdcage veil paired with canary yellow on the eyes for a bright retro look. 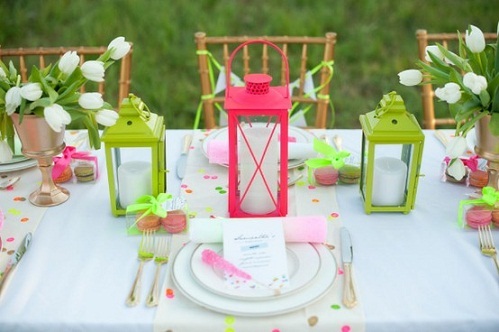 Do you have any other great ideas on how we can incorporate neons into weddings? Let us know!